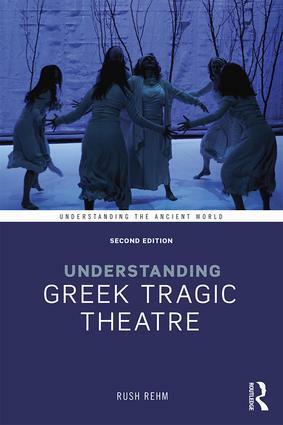 Understanding Greek Tragic Theatre, a revised edition of Greek Tragic Theatre (1992), is intended for those interested in how Greek tragedy works. By analysing the way the plays were performed in fifth-century Athens, Rush Rehm encourages classicists, actors, and directors to approach Greek tragedy by considering its original context. Emphasizing the political nature of tragedy as a theatre of, by, and for the polis, Rehm characterizes Athens as a performance culture, one in which the theatre stood alongside other public forums as a place to confront matters of import and moment. In treating the various social, religious and practical aspects of tragic production, he shows how these elements promoted a vision of the theatre as integral to the life of the city – a theatre whose focus was on the audience. The second half of the book examines four exemplary plays, Aeschylus’ Oresteia trilogy, Sophocles’ Oedipus Tyrannus, and Euripides’ Suppliant Women and Ion. Without ignoring the scholarly tradition, Rehm focuses on how each tragedy unfolds in performance, generating different relationships between the characters (and chorus) on stage and the audience in the theatre.